Getting great travel portraits is an acquired skill, one that I’m still refining after more than 40 years as a commercial photographer. I’m happy to say that I’ve made more progress with it in the last 10 years than in the previous three decades. Much of the improvement has come from the ability to review photos on the LCD while I’m shooting, allowing me to refine the image during the session. In the old days I gave my exposed rolls to a courier at a foreign airport in exchange for another brick of film. I got my critiques over the phone from a cigar smoking photo editor in San Francisco. “Get closer! Concentrate on dramatic lighting. I want more angles!” Of course he already had the Kodachromes on his light table and a reshoot was out of the question. I never saw the final images unless someone back home bought the magazine for me. It’s difficult to refine your style under those conditions. 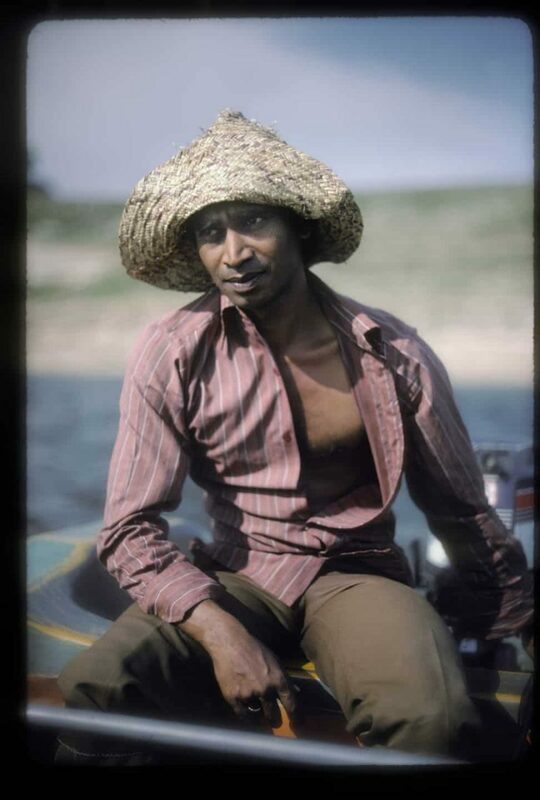 Boatman, Sri Lanka 1983 – While on assignment photographing the civil war in Sri Lanka, I hired a boatman to take me across a lake so I could avoid some army security checkpoints. He was photogenic, but his boat was facing the wrong way. I asked him to sit in someone else’s craft so he would be facing the sun for this photo. Today, getting great location portraits is easier than it was 30 years ago because you get multiple chances to finalize your image. That newfound power is best used when it counts most, while you’re shooting. Your digital camera will do the heavy lifting when it comes to exposure calculations, allowing you to concentrate on other skills like setting up the subject and composing the image — actions in front of the lens, not inside of the camera. Sri Lanka Girl – 1988 during the civil war – This young girl was quite interested in me while I photographed people lining up to buy fish on the beach. I lowered my camera angle so her head was above the line of people in the background and moved to my left until she had a perfect Rembrandt lighting pattern. I got a few serious shots and then she started laughing and ran off to help her mother and sisters with their purchases. 1- You can’t trick someone into giving you their confidence. 2- Honest and compelling photos of people are taken by honest and compelling photographers. 3- People like friendly photographers. 4- You have to feel friendly to be friendly, and you have to be friendly to look friendly. Northern Thailand, Laos Frontier – In the opium growing regions of Northern Thailand there are numerous tribes that cultivate poppy. Some tribes are oppressed by local warlords that force farmers to grow poppy. Other tribes, like the Red Karen lady shown here, have sought government protection in exchange for abandoning opium. 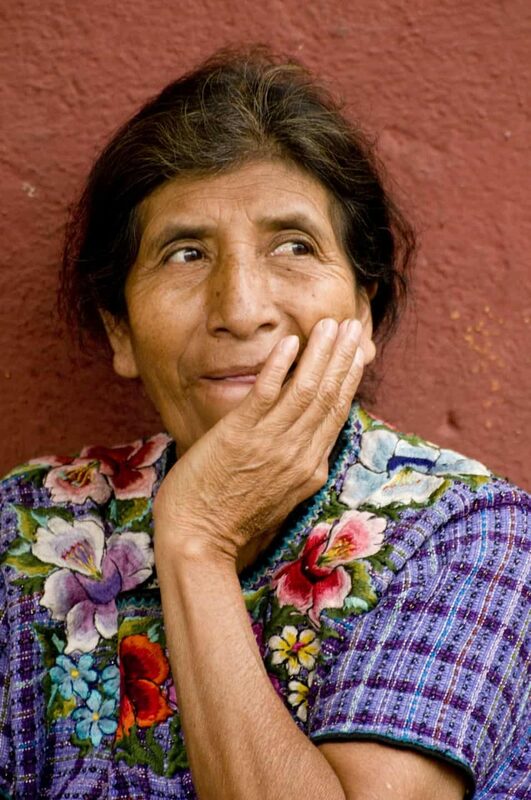 The Red Karen have prospered under government protection. I don’t hide behind dumpsters with a long lens to get my best portraits. A subject must be in close range to collaborate with them. For me, the ideal distance is two arm lengths. We should be able to touch fingertips. From this distance your smile will relax your subject’s facial muscles and help them to take a less defensive stance. Jerusalem 2011 Father Michel – I identified this great location in the doorway of a church across the street from the first Station-of-the-Cross in Jerusalem. I did some test shots and when I was satisfied with my result, I asked several subjects to pose. Father Michel, pictured here, turned out to be the best subject. He was delighted with the photos I sent to him. This approach works almost anywhere in the world, but it takes practice. If you can’t walk up to a street musician in Memphis and pose him, you’ll never be able to get a good shot of a rug salesman in Jerusalem. If you’re shy, practice your approach in a mirror first, and then try it on a friend. Work up to a local farmers market and then go to an outdoor concert or political rally. There’s no magic bullet, you have to rehearse your moves to get into the game. 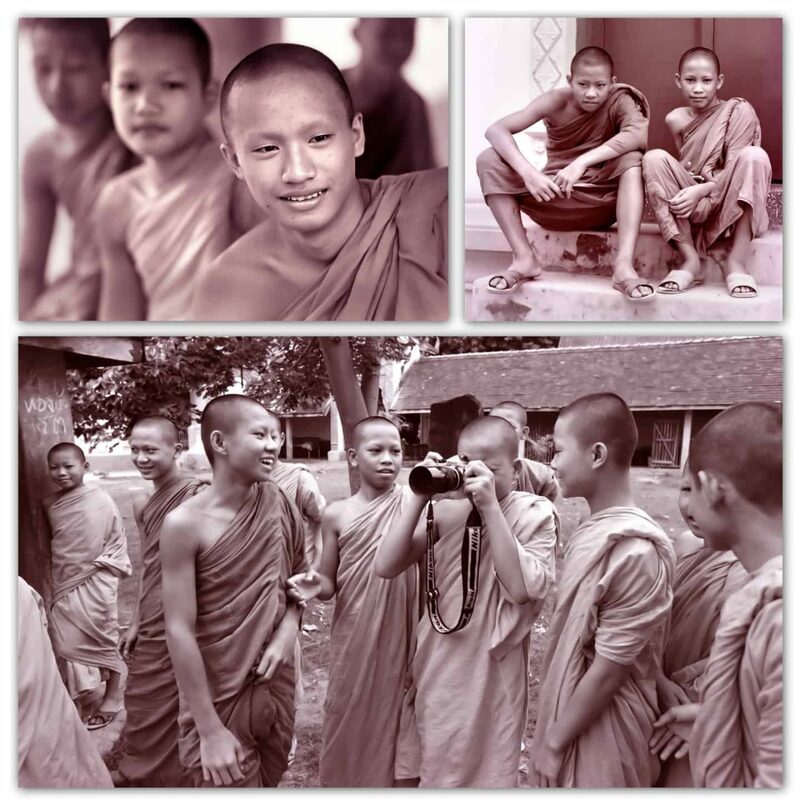 Monks in Thailand 1978 – These young novice monks were a little shy with me when I first arrived at their monastery in Thailand. I was quite inexperienced, but I took my editor’s advice about gaining their confidence and passed around my camera, encouraging them to take photos of each other. They immediately started having fun. In just a few minutes they were asking to pose for me. The process is documented in this set of photos. I begin a typical session by taking a photo from about 10 feet away and then moving in closer. People usually take up a stance that’s straight on to the camera, so I coax my new friend into a better pose by moving the camera right, left, up or down. If your collaborator trusts you, they’ll move their face, but their body will stay in place. As you move to the side, you solve the ‘straight-on’ posing problem. Santiago 2009 – Guatemala is one of the best places in the world to see people in colorful native dress, but they tend to be shy about photography. I took several shots of this nice lady with her permission, but she looked too tense. To get her to look away, I turned and pretended to be watching some children at play. When she looked in that direction I returned to my shooting and got this image. After I take another picture I move closer and compose the next shot. Here’s the important moment: I hold the camera in place while I peek around so my subject can see my eyes. This third photo is usually my best. The process of getting three or four shots takes about two minutes. Mila, Tel Aviv, Israel 2011. While wandering around Tel Aviv looking for a restaurant I passed a wall with a window that made a nice background. After lunch I went back and waited for an interesting person to come along. A woman walked by and I asked her if she would let me take her photo. I took a few full length shots and then moved in for a tight portrait. 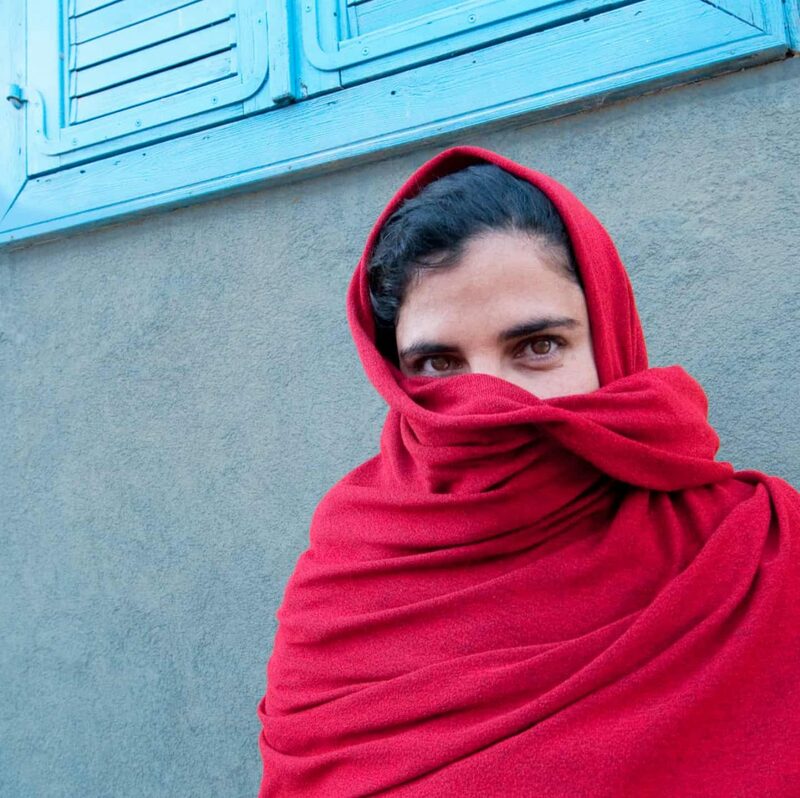 She motioned for me to stop for a minute while she pulled a red scarf from her shoulder bag and wrapped up in it, with only her eyes showing. We took a series of shots from different angles and camera heights. This is the best kind of collaboration, and it can only happen when your subject trusts you and is having a bit of fun. When I make a good photograph of someone, I want him or her to have it. I ask, “email?” If they nod, “yes,” I write the frame number of their image down on my business card and give it to them. This is more of a courtesy than anything else, because most people forget about me when my note goes through their washing machine. If the image is particularly good, I ask for their email and write it down so I can contact them. After they get their photos by email, I ask for their permission to use it in my classes and articles. Note: If you take good photos and distribute them freely, your photography and your life will improve. Indian boys – Madras, India 1987. As I was walking down a row of market stalls photographing the vendors, the people farther down the line could see me coming. Some of them scattered and others started grooming themselves. Two young boys were quite entertained and couldn’t stop laughing when I arrived to take their photo. 1- Get to know your subject by taking a few shots and then ask them to move into better light. Usually it’s just a matter of moving them into the shade, turning them away from the sun or having them face a window or open door. This takes 30 seconds or less. 2- While searching for subjects make a mental note where lighting and backgrounds are especially appealing – under an overhang, inside of an archway or near a large window. Bring your subject to that spot, or wait there and invite an interesting person to pose as they pass by. If barkers can entice people into restaurants or bars, you can get them to pause for a picture. I do it all the time. 3- Eliminate bright elements in the background by moving the camera, the subject, or cropping tightly. This will ensure a proper exposure. 4- Use RAW all the time for maximum quality, control of color balance and increased dynamic range. 5- Short depth of field is your friend. Choose a wide aperture and a fast shutter speed, even at the expense of high ISO settings. White City, Tel Aviv, Israel 2011 – I met this young man at a vegetable juice kiosk where he works in Tel Aviv. He’s originally from Ethiopia and he mentioned that finding affordable housing has been his greatest challenge since emigrating. Just across the street was a large advertisement for an exclusive high priced development called “The White City”. It was an editorial photo opportunity I couldn’t pass up. I hope you benefit from this short primer. Once you put these techniques to work, you’ll develop your own approaches. Please remember to share your photos with your subjects. If you do, your work will be more satisfying and it will make it easier for the rest of us to get a good reception when we approach people in foreign lands. 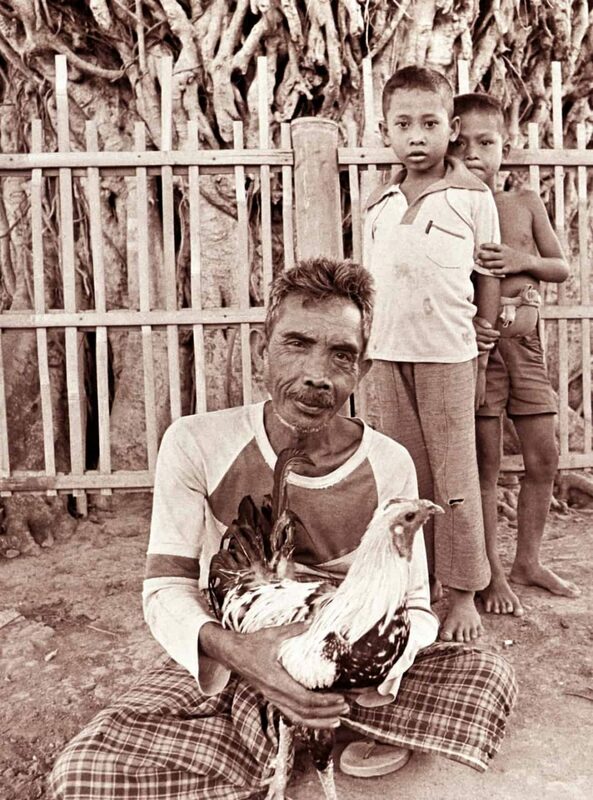 Bali Chicken man, Indonesia 1994 – I was riding a motor scooter around the island and I saw this man feeding his chickens. I wanted to get his portrait but he was a little suspicious of me, so I focused on the birds. He was quite proud of one of them and consented to a series of posed shots with it. The boys wanted to be part of the action so I placed them in the shot too. EQUIPMENT USED: Cameras – Nikon F and Nikon D-300. Lenses – Nikkor 50mm, 105mm, 85mm, and 70-300mm.